The Afghan elections are likely to be postponed at least until 2017. The two most concerning contingencies in the next twelve to eighteen months—the collapse of the Afghan government and major battlefield gains by the Taliban—are not mutually exclusive. The former could have a significant impact on the operational effectiveness of the Afghan National Army and Afghan National Police, while a successful offensive by the Taliban could weaken an already fragile government. Both could lead to a significant contraction of government control in Afghanistan. The National Unity Government collapses. Significant problems continue to plague the National Unity Government: poor governance, deteriorating economic conditions, widespread corruption, disagreements over reconciliation with the Taliban, and competition for power among political elites. President Ghani has clashed with the Afghan Parliament on numerous issues and failed to secure appointments for some critical positions, such as the minister of defense. Several major political issues also remain unresolved. The political agreement brokered by the United States that created the National Unity Government required the Afghan government to hold parliamentary and district council elections. Yet the elections are likely to be postponed at least until 2017. The agreement also stipulated that Afghanistan convene a grand assembly of elders, or a loya jirga, from across the country to amend the Afghan Constitution and formally establish the position of prime minister. But Afghan political elites disagree about the timing of the elections and electoral reform. Some elites argue that the current election commission lacks legitimacy because of its flawed handling of the 2014 elections. They contend that elections cannot be held until the election process and the Independent Election Commission are reformed. Many Afghan political elites have been deeply critical of the government. These and other disagreements could trigger a collapse of the National Unity Government. Such a contingency would seriously weaken the long-standing effort to build a functioning Afghan government, undercut the loyalty and cohesion of Afghan national and local forces, and provide an opportunity for the Taliban and various warlords to seize important areas of the country. During the early 1990s, for example, the collapse of Mohammad Najibullah’s government contributed to a substantial proliferation of well-armed militia forces. The collapse of the government could happen in one of several ways, with some possibilities more likely than others. One is that Abdullah quits as CEO and Ghani fails to quickly appoint a successor, plunging Kabul into political paralysis. This possibility could trigger widespread discontent, protests, and the defection of important government allies. Several aggrieved national, provincial, and district officials, like Balkh Governor Atta Muhammad Nur, have been publicly critical of Ghani but unwilling to leave their posts. A second possibility would be a severe deterioration of the government’s legitimacy due to economic troubles—such as skyrocketing unemployment or a prolonged energy crisis—that trigger mass protests. Grievances already exist among the Afghan population. According to a 2015 Asia Foundation poll, 57 percent of Afghans said their country was moving in the wrong direction, citing insecurity, unemployment, corruption, bad government, and other factors. A third possibility would be a decision by several powerful Afghan elites to form a parallel government or, alternatively, to hold a loya jirga that chooses other leaders. In 2014, some Afghan elites, including some supporters of Abdullah, threatened to form a parallel government rather than accept one led by President Ghani. Many Afghan political elites—including former President Hamid Karzai, parliament member Abdul Rasul Sayyaf, former National Directorate of Security chief Amrullah Saleh, and former Afghan Ambassador to Pakistan Mohammad Omar Daudzai—have been deeply critical of the government. A fourth possibility would be a coup d’état led by powerful political elites, with some support from within the government. A simultaneous Taliban offensive against several urban areas could overwhelm Afghan security forces. The Taliban take control of one or more major cities. Although the Taliban has failed to capture and hold a major urban area, that could change over the next twelve to eighteen months. The Taliban has already threatened several urban centers. Before the September 2015 Taliban blitzkrieg into Kunduz city, which freed hundreds of prisoners—including many of the Taliban’s own fighters—from the main prison, the Taliban had earlier attacked the Chara Dara district in Kunduz in May 2015 and seized it from government forces. In June 2015, the Taliban took over Dasht Archi district in Kunduz, recruiting supporters, collecting taxes, training forces, and planning military expansion. The Taliban used bases in these districts and other locations as staging areas to position fighters, weapons, and other material for the eventual push into Kunduz. The death in May 2016 of Taliban leader Akhtar Mohammad Mansour and replacement by Haibatullah Akhundzada is unlikely to substantially alter Taliban military strategy, operations, or tactics in the short term. Based on current Taliban strategy and operations, several provincial capitals, such as Lashkar Gah, Pul-e Khumri, Qalat, and even Kunduz, are suitable for a military offensive. Other possibilities include Farah, Maimanah, Asadabad, and Ghazni. The Taliban has already threatened—or tried to threaten—many of these provincial capitals by attacking static positions in outlying areas, attempting to cut off lines of communication, and conducting assassinations and improvised explosive device attacks. The Taliban also controls several districts around such cities as Laskhar Gah and Kunduz, increasing the possibility of an offensive. 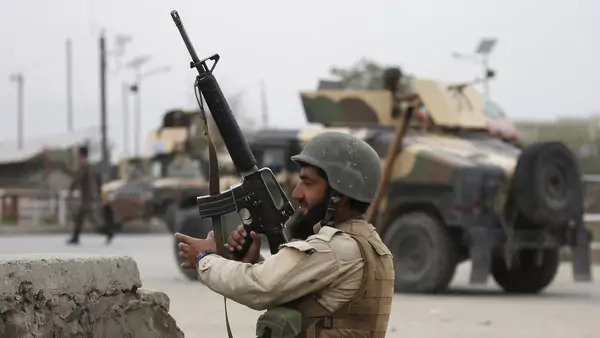 While Taliban control of one city would be challenging, a simultaneous Taliban offensive against several urban areas, including provincial capitals, could overwhelm Afghan security forces and government leaders. The Afghan National Defense and Security Forces (ANDSF) are already overextended and many units suffer from poor logistics, inconsistent battlefield leadership, and a shortage of combat “enablers” like air support. Some units, such as the Afghan National Army’s 215th Corps based in Helmand Province, have struggled to clear and hold territory in areas such as Sangin District. To compound these challenges, the Afghan National Security Council could be paralyzed as it was during the early stages of the Kunduz crisis, and fail to respond quickly with a clear, unified plan. Multiple Taliban offensives under “Operation Omari,” which the Taliban campaign announced in April 2016, would compound these problems. Most riots in Afghanistan have been in response to actions by foreign governments. Public threats by Abdullah to quit. Abdullah and his advisors have complained publicly about a range of issues, including reconciliation, Afghanistan’s relationship with Pakistan, and parliamentary and district council elections. In January 2016, Javid Faisal, a spokesman for Abdullah, objected to the Afghan election commission’s decision to hold elections in October 2016, stating: “Reforming the election process is a precondition to any election, and a part of the larger reform is the changing of current commission officials.” But Abdullah has not publicly threatened to quit. Credible threats by Abdullah or his chief advisors to defect from the government could signal a growing political crisis. Growing public protests. Deteriorating economic conditions, corruption, or government ineffectiveness could all trigger public protests. Specific examples might include a poor harvest, rising unemployment, ethnic discrimination, or severe and prolonged energy shortages. The unrest might range from contained, nonviolent protests to bloody riots that spread to other cities, districts, and provinces. There have been riots in cities like Kabul and Kandahar over the past decade, but most have been in response to actions by foreign governments, such as the 2012 burning of Qurans at Bagram Air Base. In May 2016, however, thousands marched in Kabul to protest the proposed construction of an electricity transmission line, temporarily bringing the city to a standstill. Provincial or local government officials might begin flouting Kabul’s authority. President Ghani has significant power to appoint and replace a range of national, provincial, and district officials. A provincial governor, police chief, or other appointed official who publicly refuses to be replaced, flouts Kabul, or acts independently could signal a weakening of the government. In addition, a substantial growth in the number, size, and capability of substate militias, which begin to outpace the size and strength of the ANDSF, would also be cause for concern. Taliban forces might capture one or more district centers or large villages near urban areas. The Taliban would likely conduct more localized operations to control strategic lines of communications like Highway 1, overrun security checkpoints and other static positions, and conduct propaganda campaigns in urban areas that include shabnamah (Taliban letters and leaflets posted on doors or in public locations, often at night, that threaten individuals who cooperate with the government). In addition, a substantial exodus of civilians fleeing urban areas, who fear imminent fighting, might also indicate an imminent Taliban offensive. The assassination of a top Afghan government leader. The killing of one or more important Afghan government security officials, such as Lieutenant General Abdul Raziq, the powerful police chief of Kandahar, would seriously undermine the morale and effectiveness of Afghan national and local forces. Raziq has been critical in preventing major Taliban advances in Kandahar Province because of his relationship with local tribes and subtribes, leadership skills, and fighting effectiveness. U.S. objectives include training and advising Afghan forces so that Afghanistan can provide for its own security. A significant increase in attrition rates among Afghan security forces. The ANDSF has faced intense fighting over the past year and experienced unprecedented casualty levels. Taliban forces have also faced high attrition and casualty rates. Afghan national and local forces suffer from insufficient and untimely pay, difficulties accessing pay, limited food, constant combat deployments with little or no leave or training rotations, poor casualty care, and inadequate living and working conditions. These challenges have increased attrition rates and will likely continue as the ANDSF executes its 2016 campaign plan, Operation Shafaq. But a major rise in attrition rates, including those absent without leave, could severely undermine the effectiveness of Afghan forces and increase the prospects of Taliban success. As President Barack Obama and other U.S. officials outlined in early 2013 and at various international conferences, U.S. objectives in Afghanistan include targeting the remnants of al-Qaeda and other groups, particularly ISIL-Khorasan Province (ISIL-KP), so that they cannot launch attacks against the U.S. homeland; and training, assisting, and advising Afghan forces so that Afghanistan can provide for its own security. To accomplish these objectives, U.S. policy has focused on strengthening the ANDSF; building a stronger political and security partnership with Afghanistan; supporting an Afghan peace process; enhancing regional cooperation; and fostering economic growth. These objectives remain important. Growing conflict and radicalization in Pakistan also raises concerns about the security of its nuclear stockpile. A collapse of the National Unity Government or a Taliban takeover of one or more urban areas would harm U.S. interests in several ways. First, both contingencies could lead to an increase in the number of extremist Islamic groups operating in Afghanistan. Although al-Qaeda’s core leadership has been severely weakened by persistent U.S. strikes, al-Qaeda’s local branch, al-Qaeda in the Indian Subcontinent, has increased its presence in Afghanistan in such areas as the south and east. U.S. and Afghan forces conducted raids against al-Qaeda camps in Kandahar Province in October 2015, but al-Qaeda continues to operate in such provinces as Kandahar, Konar, Nangarhar, Helmand, Ghazni, and Logar. A successful Taliban-led advance would likely allow al-Qaeda and other terrorist groups such as the Tehreek-e-Taliban Pakistan, Haqqani network, ISIL-KP, and Lashkar-e-Taiba to increase their presence in Afghanistan. ISIL-KP, led by Hafiz Saeed Khan and deputy leader Abu Bakr, enjoys a stronghold in Nangarhar Province. Second, a collapsing National Unity Government and a burgeoning war could increase regional instability as India, Pakistan, Iran, and Russia support a mix of Afghan central government forces, substate militias, and insurgent groups. This would likely further fracture Afghanistan’s national and local forces. Growing Taliban control of Afghanistan and an increase in militant groups could also increase regional friction, including between nuclear-armed India and Pakistan. Growing conflict and radicalization in Pakistan, in turn, also raises concerns about the security of its nuclear stockpile. In addition, these contingencies would almost certainly increase refugee flows out of the region. Afghan refugees are currently the second-largest refugee population in Europe, according to the UN High Commissioner for Refugees. Third, a Taliban takeover of strategic areas could foster a perception among some countries and organizations, however misplaced, that the United States is not a reliable ally. Islamic extremists would likely view Taliban advances as another defeat for the West amid resurgent Salafi-jihadist activity in Africa, the Middle East, and Asia. Although some U.S. officials might prefer that U.S. allies and Afghanistan’s neighbors take the lead in stabilizing Afghanistan, there are few viable prospects. Most European allies have indicated that they would likely withdraw their military forces in the event of an American exit, leaving behind regional powers with conflicting interests. The United States has several options to prevent these contingencies from occurring. Options for reducing the possibility of a government collapse. The United States could focus diplomatic efforts on helping to resolve Afghanistan’s most critical political challenges, particularly by holding parliamentary and district council elections and convening a loya jirga. U.S. diplomats and White House officials were instrumental in negotiating the political agreement that led to the National Unity Government. One of the most divisive issues is electoral reform, including the role and makeup of the Independent Election Commission. U.S. diplomats could play an important role in helping broker a compromise on electoral reform and providing financial aid and technical support so that elections can eventually occur. U.S. diplomatic efforts thus far have fallen short of successfully negotiating an agreement. A related option is helping the Afghan government and organizations such as the UN Assistance Mission in Afghanistan (UNAMA) organize elections. Second, U.S. diplomats could consider working more urgently with the World Bank, International Monetary Fund (IMF), and major financial contributors to better address acute economic and governance challenges. Rather than focusing on a broad array of economic issues, U.S. diplomats might concentrate on those outcomes—such as a poor agricultural harvest, rising unemployment, and a prolonged energy shortage—that could severely exacerbate public opposition to the government. An electricity blackout, like the one that occurred in Kabul in January 2016 following the Taliban sabotage of Kabul’s main power supply, could decrease morale and increase popular grievances against the government, particularly if it was prolonged. U.S. forces can train, advise, assist, and accompany Afghan forces and conduct direct-action missions. A third set of options includes additional coordination with regional countries on such issues as decreasing outside aid to insurgent groups, encouraging greater support for Kabul, and increasing reconciliation efforts. The United States could also withhold a significant portion of reimbursements and support that is authorized for Pakistan under the National Defense Authorization Act until the secretary of defense certifies to Congress that Pakistan has taken such steps as arresting senior Taliban and Haqqani officials in Pakistan. On reconciliation, the United States could play a more active role in reconciliation discussions, particularly since China’s increased involvement in the reconciliation process has had limited results. In coordination with Kabul, the United States might consider including Taliban members in a future loya jirga. Options for decreasing the likelihood that the Taliban seizes and holds one or more urban areas. The United States could halt further reductions—or even increase—the number and type of U.S. forces in Afghanistan. These forces can train, advise, assist, and accompany Afghan forces and conduct direct-action missions; supplement Afghan forces with more intelligence, surveillance, and reconnaissance enablers; and increase close air support. The United States could also broaden U.S. counterterrorism legal authorities to proactively target the Taliban and Haqqani network. At the moment, U.S. forces can only target al-Qaeda and ISIL-KP operatives in Afghanistan, except in situations where extremists are plotting attacks against U.S. or other international forces or during in extremis cases where the Afghan government requests U.S. aid. The United States could also increase the authority for U.S. forces, particularly conventional forces, to train Afghans below the corps level. The United States could sustain—or even increase—international financial support to the ANDSF to help improve retention initiative packages and prevent a drop in salaries. The decrease in international support and low gross domestic product growth have undermined morale and the ability of Afghan forces to achieve their authorized force strength. The Afghan National Army is currently authorized for a strength of 187,000 personnel; the Afghan National Police for 157,000 personnel; General Command of Police Special Units for 6,000 personnel; Afghan Local Police for 45,000 personnel; and Afghan Air Force for 8,000 personnel. Additionally, the United States could encourage other countries—such as India, Russia, or European states—to provide more security assistance to the ANDSF. Finally, the United States could be more aggressive in encouraging fissures within the Taliban movement by conducting a range of information operations and, in coordination with the Afghan government, contacting disillusioned Taliban leaders. One opportunity is greater interaction with—and possibly even support to—groups like the Islamic Emirate High Council. Led by Mullah Mohammad Rasool, the Islamic Emirate High Council is composed of former Taliban members and emerged in late 2015 as a Taliban opposition group. The United States could take several steps to mitigate the consequences of a government collapse or a Taliban takeover of one or more urban areas. Options if the government collapses. Depending on the type of government collapse, senior U.S. officials could conduct emergency diplomatic intervention to broker an agreement between President Ghani, CEO Abdullah, and influential political elites. It would also be important to consult regional powers—such as China, India, Iran, Pakistan, and Russia—and leading countries participating in the NATO-led Resolute Support Mission to find a workable solution to government collapse. Depending on the scenario, U.S. policymakers could support patching up the government, identifying a successor to Abdullah as CEO, or even encouraging Afghans to choose a new leader through presidential elections. In a situation where Afghanistan faced an acute economic challenge that threatened government legitimacy, the United States could work with relevant international organizations (such as the IMF and World Bank) and states (such as EU members) to provide an emergency financial package. The United States could punish Pakistan for supporting the Taliban and its allies by cutting off all or most U.S. aid. Options if the Taliban seizes and holds one or more urban areas. To stem the Taliban advances, the United States could provide emergency aid via U.S. special operations forces, limited numbers of conventional forces, and air power to take back Taliban-controlled areas; increase deployment of U.S. fixed-wing aircraft and attack helicopters; and increase U.S. intelligence, surveillance, and reconnaissance assets and other enablers. The United States could also pressure NATO and other allies operating under the Resolute Support Mission to augment their forces (including advisors and trainers) and equipment. In order to avoid becoming more directly involved in the fighting, the United States could provide material support to Afghan national and local forces, instead of increasing U.S. and allied deployments. This could involve providing the Afghan air force with additional ground attack aircraft, light attack aircraft, and light attack helicopters. Finally, the United States could punish Pakistan for supporting the Taliban and its allies, such as the Haqqani network, by cutting off all or most U.S. aid. The U.S. Congress could, for example, help by inserting waiver-free conditions in some U.S. military aid, requiring evidence that Pakistan is targeting militant groups based in Pakistan that are operating in Afghanistan, including through law enforcement and judicial proceedings. Because the United States has other important goals in Pakistan—such as supporting the fight against terrorist groups such as the Pakistani Taliban—aid and reimbursements for those activities and for civilian development programs should remain exempt from these conditions. Focus U.S. diplomatic efforts on resolving acute political challenges. Washington’s most important political priority should be to focus U.S. diplomatic efforts on working with the Afghan government and political elites to reach a consensus on contentious issues such as electoral reform. The United States should concentrate on helping Kabul and UNAMA to issue new voter identification cards, clarify district centers, train polling staff, and provide security for future elections. It makes little sense to hold elections until there is electoral reform, and Afghanistan should not hold a loya jirga until there is a broader consensus on its ultimate purpose. Poorly organized parliamentary and district council elections marred by corruption and a contentious loya jirga would be more destabilizing than helpful and could expedite strategic reversal. In addition, Washington should continue to encourage regional diplomatic efforts to reconcile with the Taliban, including exploring the possibility of inviting the Taliban to participate in a future loya jirga. Unlike several other Islamic countries, Afghan leaders want U.S. forces to stay. Address economic grievances that could trigger violent unrest. The United States should also work with the World Bank, IMF, and major financial contributors to tackle acute economic grievances that could severely undermine the political legitimacy of the government, such as unemployment, agricultural failure, an electricity crisis, or bank failure. Sustain the current number and type of U.S. military forces through the end of the Obama administration. The United States has approximately ten thousand forces in Afghanistan, along with six thousand forces under the NATO-led Resolute Support Mission. President Obama should refrain from cutting the number of U.S. forces to 5,500, as he promised to do by the end of his presidency. Although this would involve changing course from his October 2015 statement, sustaining the current number of ten thousand forces is crucial to decrease the likelihood of a Taliban advance. Obama could argue that a sustained U.S. presence in Afghanistan is important for counterterrorism operations against al-Qaeda and the Islamic State. Afghanistan could be conceptualized as one of several “lily pads” in a global campaign against violent extremists. Unlike several other Islamic countries, Afghan leaders want U.S. forces to stay. Cutting the U.S. presence to 5,500 forces would essentially end the U.S. capability to train, advise, assist, and accompany Afghan national and local forces. The Obama administration should sustain intelligence, surveillance, and reconnaissance enablers and close air support into 2017. Depending on how conditions in Afghanistan develop over the rest of 2016, the next administration can then reassess the number, type, posture, authorities, and priorities of U.S. military forces in Afghanistan. The United States should also work closely with countries participating in the NATO-led Resolute Support Mission to sustain their current numbers and roles. Current regional leads include Italy in the west with roughly eight hundred troops, Germany in the north with approximately eight hundred forces, and Turkey in the capital region with five hundred forces. A sustained U.S. and NATO-led security role is important, since a larger military role for several of Afghanistan’s neighbors would be either infeasible (Afghans continue to harbor animosity against the Russians for their invasion in the 1980s), increase regional security competition (a larger Indian security role would likely increase friction with Pakistan), or undermine American interests (a more robust Iranian security role would likely be counterproductive for Washington). Decrease constraints on U.S. forces in Afghanistan. U.S. forces are hamstrung by legal authorities that prevent them from targeting Taliban and Haqqani leaders except under extraordinary circumstances. President Obama should grant the military new authorities to strike the Taliban and Haqqani network, as he did with ISIL-KP in January 2016. Obama should also loosen the restrictions on U.S. forces, particularly conventional forces, to train Afghans below the corps level. Sustain U.S. support for the Afghan National Defense and Security Forces. Over the past several decades, no Afghan government has been able to sustain itself without support from outside powers. This has been particularly true of Afghan forces when the country faced a serious security threat, as it does now. It is much cheaper for the United States and its allies to support Afghan security forces than it is to deploy large numbers of U.S. and other NATO soldiers. The United States provided $4.1 billion to the ANDSF in fiscal year 2015 and another $3.8 billion in fiscal year 2016. Assuming there is a democratically elected government in Afghanistan, the United States should commit to providing at least $3.8 billion per year for the next five years to help sustain the Ministry of Defense’s and Interior’s costs, improve retention initiative packages, and prevent a drop in salaries. One example should be a rapid buildup of the Afghan Air Force, which is plagued by low operational readiness, maintenance problems, and a lack of trained aircrew. In the long run, the air force can play a crucial role by conducting close air support missions and airlifts. The United States should provide additional training to the air force, additional light attack aircraft such as the A-29 Super Tucano, and light attack helicopters such as the MD-350.